The Golden Temple is located in Amritsar, Punjab. The door panels are decorated with artistic style. It opens on to the bridge that leads to the main building of Sri Harmandir Sahib. It is 202 feet in length and 21 feet in width. Its architecture represents a unique harmony between the Muslims and the Hindu architecture. The fourth Guru of Sikhism, [Guru Ram Das], excavated a tank in 1577 which subsequently became known as Amritsar (meaning: Pool of the Nectar of Immortality), giving its name to the city that grew around it. In due course, a Sikh edifice, Harmandir Sahib (Temple of God), was constructed in the middle of this tank which became the supreme centre of Sikhism. The Golden Temple or Darbar Sahib is the most sacred temple for Sikhs. It is a symbol of the magnificence and strength of the Sikh people all over the world. The Tawang Monastry is located in an elevation of 10,000 feet at Tawang Town in Arunachal Pradesh. In an assembly hall there is Golden Buddha statue 8.3 m high which is 3 storeys high and occupies an area of 140 sq mt and houses 65 residential buildings. The kakaling (entrance gate) is a large hut shaped structure made of stone. The monastery was founded by Merak Lama Lodre Gyatso in 1681. The Tawang Monastery is of the Gelugpa sect of Buddhist and is the largest centre for Buddhist cultural studies. Tawang Monastery is the largest Buddhist monastery in India. The monastery has a library containing 400 year old Kangyur manuscripts. The Seven Wonders of India initiative was held nationwide with states clubbed under 16 clusters. After the commencement of this campaign, seven top wonders in each state cluster were declared. A top wonder was then chosen as a nominee from each of these states for the final seven wonders of India. 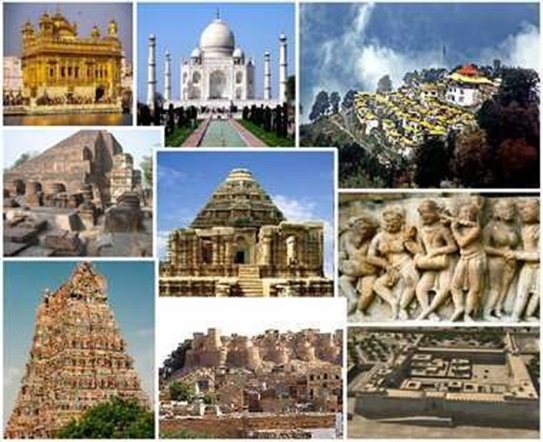 The “Seven Wonders” are: The Red Fort, Jaisalmer Fort, Nalanda University, Sun Temple of Konark, Meenakshi Temple, Dholavira site and Khajuraho, Tawang Monastery in Arunachal Pradesh and the Golden Temple in Amritsar. Khajuraho is a village in Madhya Pradesh, located in Chhatarpur District, about 620 kilometers southeast of Delhi. • The Khajuraho temples adhere to a northern Indian shikhara temple style and often to a Panchayatana plan or layout. • Kandariya Mahadeva, comprises eighty-four shikharas, the main being 116 feet from the ground level. • The Khajuraho temples were built over a span of a hundred years, from 950A.D. to 1050A.D. They were rediscovered during the late 19th century. • Khajuraho has the largest group of medieval Hindu and Jain temples, famous for their everyday life sculpture. • All its buildings are almost exclusively built out of brick. • The ancient site at Dholavira, is flanked by two storm water channels; the Mansar in the north, and the Manhar in the south. • Reservoirs are cut through stones vertically. They are about 7 meter deep and 79 meter long. • The site was occupied from about 2900 BC for about a millennium, declining slowly after about 2100 BC, briefly abandoned and then reoccupied, finally by villagers among its ruins, until about 1450. • A sign board with ten huge Indus signs found on the floor of a room at the North Gate was probably originally displayed above the gateway. • Located in the second largest city of Tamil Nadu i.e Madurai. • The temple complex is within a high-walled enclosure, at the core of which are the two sanctums for Meenakshi and Sundareshwara, surrounded by a number of smaller shrines and grand pillared halls. • The original temple was built by Kulasekara Pandya, but the credit for making the temple as splendid as it is today goes to the Nayaks. • The Nayaks ruled Madurai from the 16th to the 18th century and left a majestic imprint of their rule in the Meenakshi – Sundareswarar Temple. Sundareshvara and his consort Parvatior Meenakshi. • According to legend Madurai is the actual site where the wedding between Shiva and Meenakshi took place. • Located 55 miles from Patna in Bihar. • Nalanda was the largest residential centre of learning in the world with a 9 storied library. • The monasteries are built in old Kushan architectural style, in a row of cells around a courtyard. • It was the Buddhist center of learning from 427 to 1197 CE partly under the Pala Empire. • It is believed that Buddha visited Nalanda during his last tour through Magadha, and it was there that Sariputta uttered his lion`s roar, affirming his faith in the Buddha. • University of Nalanda was established in 450 CE under the patronage of the Gupta emperors, notably Kumara Gupta. • Nava Nalanda Mahavihara is devoted to the study and research in Pali Literature and Buddhism. • Situated at a distance from the famous religious and tourist centre of Puri (35 Km.) and the capital city of Bhubaneswar (65 Km). chariot with seven horses and twenty four wheels, each about 10 feet in diameter, with a set of spokes and elaborate carvings. • It was built in red sandstone (Khandolite) and black granite. life all in its wondrous variety. • It was built by King Raja Narasimhadeva-I of the Eastern Ganga Dynasty in the thirteenth century. • It is a temple to Surya, the sun God. • The Sun temple has been declared a world heritage site by UNESCO. • It is situated in Jaisalmer city in Rajasthan. • The fort stands admist the golden stretches of the great Thar Desert, on Trikuta Hill and had been the scene of many battles. • It is also known as the “Golden Fort”. • It is built of sandstone and is one of the largest forts in Rajasthan. • It was built in 1156 AD by the Bhati Rajput ruler Rawal Jaisal, from where it derives it name. • At one point of time the entire population of Jaisalmer used to live within the fort; but with the increase in the population, people were forced to move out and find shelter under the foot of the Trikuta Hill. • The main attractions inside the fort are: Raj Mahal (Royal palace), Jain temples, Laxminath temple, 4 massive gateways, Merchant Havelis. • Located in Chandni Chowk, Delhi. • Thick red sandstone walls, bulging with turrets and bastions, have withstood the vagaries of time and nature. • The wall is 2.5 km long and the height varies from 16 meters on the river side to 33 meters towards the city. • Diwan-e-am is the large pavilion which was used for public imperial audiences. • Diwan-e-khas is the decorated hall which was used for ministerial and court gatherings. • The Red Fort and the city of Shahjahanabad was constructed by the Emperor Shah Jahan in 1639 A.D.
of India hoists the national flag and addresses the nation, from the ramparts of Red fort.